For decades Widor was known, not so much as a one-work composer as a one-piece composer – everyone knew his Toccata but only a handful of organists knew the complete Symphony from which it came. One of the great changes that the CD brought to musical life was a fundamental change in the relationship between recorded and live music. Previously, recorded music had reflected what was going on in the recital room, the concert hall and the opera house, but CD recordings became primarily a self-sustaining musical experience. Innovative companies – Naxos very much then, as now, at the vanguard of such innovation – realised that the CD presented an opportunity to go beyond what was being offered to live audiences and explore areas of the repertory which were both neglected and obscure. Added to this the growing Cult of Comprehensiveness – a desire to commit to record every single note committed to paper by any given composer – and the inevitable result was a world of music available on CD which not even the most adventurous performer or music lover would ever otherwise have encountered. One of the greatest beneficiaries of this (for want of a better phrase) explosion of exposure, has been Charles-Marie Widor. Organists have long known Widor, even if it has taken the CD to bring all his organ music into the public arena, but until the advent of the CD very few people were even aware that he had produced a huge body of music never intended either for the organ console or the church. The CD catalogues now include recordings of songs, chamber music with piano, violin music and piano concertos, to which Naxos have added this disc which describes itself as the “Complete Works for Woodwind”. To be totally correct, this disc actually goes rather beyond its scope by including a work for violin and piano in an arrangement made, not by the composer or any of his contemporaries, but by the Dutch flautist Rein de Reede, who has also written the booklet notes for this CD. (The Suite Florentine can be heard in its original guise on a Centaur disc (CRC2475) with Janet Packer and Orin Grossman.) However, there is some anecdotal evidence that a version for flute and piano appeared in Widor’s own lifetime, so its inclusion here is possibly justified on historic grounds. It is more than amply justified on musical grounds, however, for Thies Roorda makes an incontestable case for it as a fine flute work, and his is both a wholly idiomatic performance and an utterly convincing one – to the extent that it is difficult to imagine this music played on the violin. In particular the sprightly, and delicately dance-like final movement (oddly entitled “Tragica” – evidence of the music’s actual origins in some incidental music Widor wrote for a stage play about Vicomte de Borelli, which is, interestingly, not one of the seven works for the stage Grove gives in its work list for Widor) is as perky and impish a bit of flute writing as you will find anywhere in the repertory. With neat and impeccably balanced support from Alessandro Soccorsi, this is a performance which should win over any of those who still hold to the belief that Widor is nothing other than a staid and stolid composer of hefty organ works. An original Widor work for flute and piano is the Suite Op.34 which preceded the Suite Florentine by around 40 years. Composed in 1877, it is dedicated to Paul Taffanel, who performed the work in April 1884 at a concert given by the Société des instruments à vent in Paris, where it was highly praised. Certainly this is a distinctly virtuoso work, with a highly dramatic opening movement followed by an almost Mendelssohnian scherzo, full of fluttering figures and delicate textures which, on this recording, Roorda flies over with remarkable agility and impressive breath control. Only with the third movement do we recognise Widor the organ composer, with a solemn “Romance” which, for those in the know, could easily have been lifted from one of his organ symphonies but which, nevertheless, seems completely at home on flute and piano. The final vivace movement appears twice on the CD. The first time it appears in the 1884 version which Taffanel performed in Paris (and repeated on several subsequent occasions) while the original 1877 version is also included. An example, I fear, of the Cult of Comprehensiveness, for while the second version extends the movement by around a minute and a half – presumably to allow Taffanel greater opportunity to build up to a closing virtuoso flourish – musical differences seem merely cosmetic. 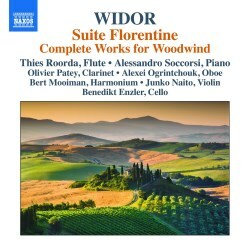 A feature of Widor’s writing, as revealed in this CD, is his innate understanding of the character of the various instruments he selects as soloists. The Introduction et Rondo is a prime example of utterly idiomatic clarinet writing, with its long-breathed melodies interrupted by agile flourishes across the range and clever use of the various tone qualities at different registers of the instrument. It was written as an examination piece for Conservatory students and used as an orchestral audition piece for applicants to the orchestra of the Paris Opera; with some gratuitous scales and technical challenges its origins are clear. Nevertheless, it remains a fine piece of music in its own right, and Olivier Patey is a splendidly demonstrative player, introducing a degree of elasticity to the tempo which might seem simply self-indulgent in other players, but makes absolute musical sense here. As ever, Soccorsi is absolutely on the ball in shadowing Patey’s extreme rhythmic byways and outbursts, and the only disappointment is that on the day this recording was made (5 March 2015) nobody had thought to fine-tune the piano. While Widor did not actually write any music for oboe solo, the arrangement of three pieces for the instrument by Albert Rey was done with the composer’s full knowledge and, we assume, approval. The first, Pavane, was originally for solo piano, and is a graceful, gentle movement spiced up by a few small harmonic surprises. The other two – Elégie and Pastorale - come from original organ works. The former appears as the sixth movement (“Meditation”) of the First Organ Symphony, where the solo line is designated for the flûte stop, and in this arrangement takes on a distinctly melancholic character because of the nature of the oboe, while the latter, taken from the Second Organ Symphony, is given a faster tempo marking and a more animated accompaniment (the organ original designated this line to the Hautbois stop). Alexei Ogrintchouk’s fluent and well-poised playing makes all three sound totally convincing as oboe pieces. Widor is shown through these works to be a fine craftsman whose musical ideas are clearly delivered and elegantly proportioned. With the intriguingly scored Sérénade for flute, violin, cello, harmonium and piano, we get a glimpse of something rather more individual and witty. It begins elegantly enough, much in the manner of a ballroom waltz (reminiscent of Schoenberg’s rescoring of Johann Strauss for string quartet, piano and harmonium). But a bouncy fugue subject introduced by the harmonium (3:09), which seems to be an off-cut from an organ symphony, leads the music into something altogether more witty and bubbly. The interplay between the five instruments is magnificently handled in a fine exhibition of masterly manipulation of instrumental colour. Here is the master-organist at work, blending and mixing his colours, drawing together seemingly opposing musical timbres to create an entirely new and distinctive sound. The booklet notes suggest that the piece “languishes rather too extensively in the ambience of salon music”, but its elegant charm and distinguished proportions, so eloquently delivered by these performers, make it a pure moment of joy to be savoured in that unique environment in which each of us listens to our CDs.